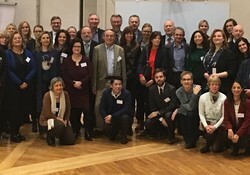 The Action Network on Measuring Population and Organizational Health Literacy (M-POHL Network) was established under the umbrella of the WHO European Health Information Initiative (EHII) and aligned with Health 2020, the European policy framework for health and well-being. The Network aims to institutionalize a regular internationally comparative European health literacy survey of high quality and support the collection of data on organizational health literacy as prerequisites for evidence-based policy and practice on health literacy. WHO defines health literacy as the cognitive and social skills which determine the motivation and ability of individuals to gain access to, understand and use information in ways which promote and maintain good health. In recent years, a general consensus has been built in which health literacy is seen as an evolving concept and more than just health education by itself. As a key determinant of health and an important dimension of Health 2020 – closely related to other social determinants of health such as general literacy, education, income and culture – health literacy is crucial for attaining the social, economic and environmental goals of the 2030 Agenda for Sustainable Development. The first meeting of the M-POHL Network was organized and hosted by the Federal Ministry of Labour, Social Affairs, Health and Consumer Protection of Austria and took place in Vienna on 22–23 February 2018. Participants from 19 Member States of the WHO European Region and representatives of international organizations and networks – such as the Organisation for Economic Co-operation and Development (OECD) and Health Behaviour in School-aged Children (HBSC) – agreed on aims, goals and modus operandi of the newly founded network and discussed preparations for the next comparative international health literacy study scheduled for 2019. In her opening address, Dr Claudia Stein, Director of WHO/Europe’s Division of Information, Evidence, Research and Innovation, said, “this is a network that starts with a bang! Not only is it tremendously important but at its very first meeting it already brought 19 Member States together. This must be a record”. the promotion of dialogue and synergy with other networks of relevance to health literacy with the support and under the coordination of EHII. The Vienna Statement on the Measurement of Health Literacy in Europe adopted during the meeting reaffirms the M-POHL Network’s commitment towards the implementation of the Action Plan to Strengthen the Use of Evidence, Information and Research for Policy-making in the WHO European Region (resolution EUR/RC66/R12) and calls on the Member States to join the Network and share their best practices and experiences on measuring and improving population and organizational health literacy.